I always feel like I have to say “for Valentine’s Day” whenever anything looks all pink and red and amazing! But honestly this Chocolate Bundt Cake is perfect any time of the year! I actually made a Thanksgiving version several months ago and it was a hit! 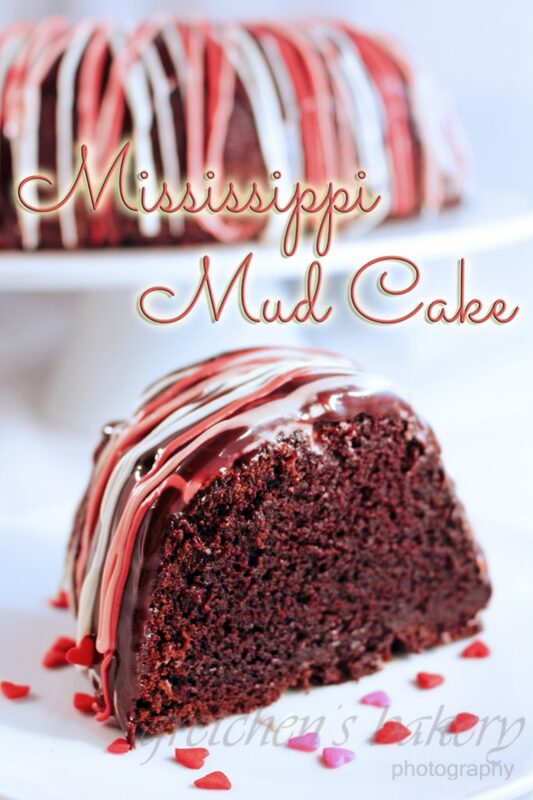 Super moist chocolate mud cake needs no icing! How often can you say a cake can stand alone with no icing needed? 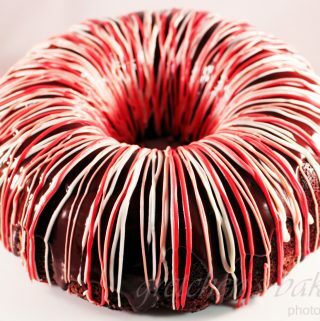 A thin glaze of chocolate just so it doesn’t look so “naked” and of course the colorful chocolate to make it perfect for whatever holiday you are celebrating! This recipe has quite alot of ingredients which for some people may be a turn off right away. But once you taste this rich, dense, chocolate heaven in a plate, you will realize how worth it, it all is! I’ve made this recipe into layers for layer cakes, cupcakes for the best cupcakes you will ever eat; and miniature bundt pan style too! Oh yeah, by the way I add bourbon to this recipe for an amazing depth of flavor that is unmatched! You can omit that and just replace it with another liquor like Rum or Frangelico or even Grand Marnier would be awesome! Or more coffee if you want to forgo the alcohol altogether. If coffee is something you also look to replace (I am crying now) you can just use all water, but be aware the flavor will just not be the same. Coffee really brings out the richness of chocolate and why it is so often used in cake recipes. One note about this cake though, it can be a real bear to get out of the pan! Bundt pans are already notorious for sticking cakes, and this recipe (even the original non vegan version) would sometimes give me trouble! So be sure to use a really good pan grease click here for my recipe, AND be generous with it! Also let it cool all the way in the pan before trying to unmold it. If it gets so cooled that it is actually COLD this is Ok, just take a blowtorch or dip the pan into HOT water to release those surface fats and it should come out easily. A plastic knife to loosen the edges and some of the sides would also help. I don’t want to scare you from this recipe since it is hands down my favorite tasting chocolate cake recipe on the planet. 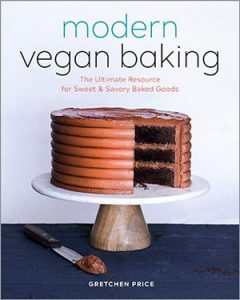 It can be made into cupcakes and layer cakes too and with the parchment lining in cake pans the unmolding in never a problem, its just the bundt cake here that may be a headache. I have also found that those ceramic bundt pans are the worst! Definitely go for a non stick bundt pan for the best results! But if for some reason you do get a stuck or semi broken cake, you can sometimes stick it back together and then the ganache glaze will cover up the disaster! Or make them into cake balls like I did here! But hopefully you won’t have any problems and you will also find that this cake is your new favorite chocolate cake on the planet! Cool completely and then ice with chocolate glaze and colored sugar glaze as I mentioned in the above text. This cake is beautiful :)! This sounds excellent for Mardi Gras too. YES!! Just change the colors for any holiday! It is truly amazing recipe! Hi Gretchen! 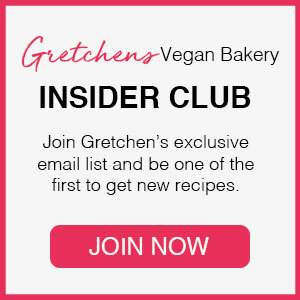 Speaking of Mardi Gras, do you have a recipe for vegan King Cake? Yikes! Im soooo behind on my holidays! No I havent shared a King Cake this time around. But I would use my Danish Dough recipe use flax for the eggs and then form it like the king cake! Horror of horrors, can we non-vegans use eggs? If so how many? Thanks for the recipe and like to bake one asap. But what can i replaced for flax meal and can I omit whisky? Are the whiskey and applesauce necessary? From the blog post: Oh yeah, by the way I add bourbon to this recipe for an amazing depth of flavor that is unmatched! Coffee really brings out the richness of chocolate and why it is so often used in chocolate cake recipes. Gretchen I did not read anywhere about how delicate this cake is! I have never knocked a cake out of a pan and had it fall completely apart! This is my first attempt at one of your vegan recipes the flavor is delicious the next time I make it I guess I will need to wait until it’s completely cooled and take a plastic knife to get it out of the pan with. Hi Lisa, I will make that note for sure because this has happened to me too with this recipe- I believe I noted it and actually SHOWED it in my Thanksgiving version of this cake CLICK HERE but did not flow that information through here, Im sorry about that but I will update now. When mine fell apart on the Thanksgiving version I proceeded to make whiskey cake balls and they are an amazing save to an otherwise major fail! Sorry this happened, bundt cakes can be a bear and this recipe adds to the chaos, but worth it for sure! This is by far my favorite tasting chocolate cake! I made this cake in 13×9″ baking pan , the taste turned out to be very good but the cake was unmanageable, it fell apart into pieces 🙁 I bake for 15 minutes at 350 °. Any advice?